Patti Anklam | I’m with Phil. Won’t You Help, Too? I’m with Phil. Won’t You Help, Too? This quirky idea came from a Phil Campbell I am related to by marriage, that is, my brother’s marriage to Phil’s sister, Veronica. Phil and Veronica found out about and visited this small town in Alabama n 1994, and that discovery led to the the first Phil Campbell gathering in Phil Campbell in 1995. All persons named Phil, Philip, Phillip, Philippe, Philipp, Philippa, Felip, Felipe, Filip, Filippo, Filippu, Filipe, Filype, Phylip, Phillep, Pilib, Fülöp, Fulup, Phyllis, Philice, and Philomena that our Phil could find were invited. In 1995, 22 Phils and 1 Phyllis showed up. The 2011 event was planned to coincide with the 100th anniversary of the town. Hundreds of namesakes had been located and invited, including Phils from Australia and the UK. Phil also invited Jason Biggs, the Hollywood actor who plays him in the upcoming film “Grassroots,” as an honorary Phil Campbell. Jason will be there. However, last month’s tornadoes hit the town of Phil Campbell very hard; 26 deaths were confirmed, the school and churches were demolished. 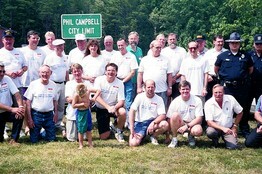 Under our Phil’s leadership, the gathering of Phil Campbells quickly became a relief effort. The gathering will go on as planned, but the Phils, Philips, Phyllises, Felipes, etc. will show up ready to volunteer for rebuilding efforts, and with as large a check as possible to go to the relief and rebuilding of Phil Campbell, AL. You can help, too. If you haven’t (or even if you have) already donated to support tornado relief efforts, you can do so on the I’m with Phil site. Let’s help the Phils make it a really big check. Posted in causes, people. RSS 2.0 feed.